In 1147 the site was occupied by the church of The Nativity Of Our Lady and the Innocents. 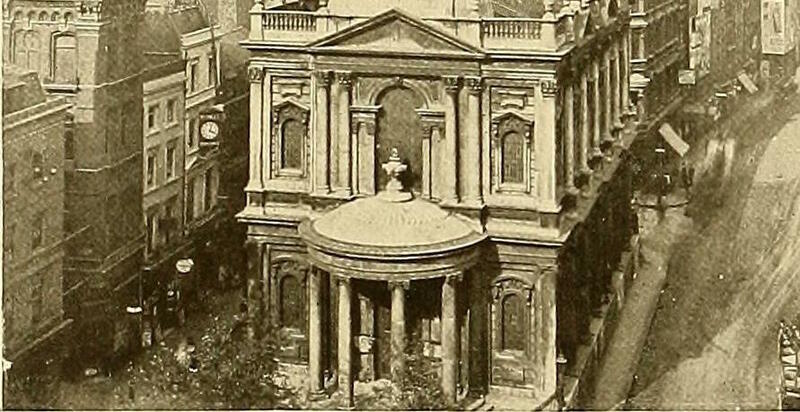 This was demolished in 1549 to make way for Somerset House, Protector Somerset promised to rebuild it but never did so and for nearly 200 years the parishioners had used the Savoy Chapel. A maypole used to stand on the green outside. 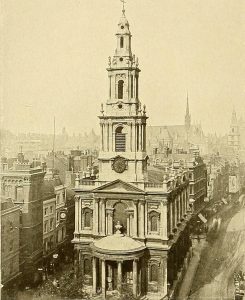 During 1714-1717 the present small baroque church designed by James Gibb, was built as the first of the 50 new churches which were built in London in accordance with the act of 1711. It was Gibbs’s first public building and ‘Got him great reputation’. He had recently returned from Rome, where he spent several years as Carlo Fontana’s pupil. The walls of St Mary’s show the influence of Michaelangelo and the steeple of Wren. The ceiling was inspired by Fontana’s SS Apostoli and Pietro de Cortana’s SS Luciae Martina, the porch by Cortana’s S Maria dell pace. A 76 metre column topped by a statue of Queen Anne was planned to stand in front of the church but the Queen died and a spire was built instead. The fate of the brass statue of the Queen, which had been made in Florence by John Talman is unknown. In 1750 Bonnie Prince Charlie is said to have been received into the church of England here during a five-day secret visit. Charles Dickens parents were married here in 1809. In 1871 the interior was refitted by R.J Withers. Spared by the blitz, it was neglected for the years until a campaign was launched by John Betjeman in 1977 to restore it. The church re opened but is besieged by traffic and in great need of further restoration.